﻿ Book Paradisus Palma Real Golf & Spa Resort All Inclusive (Punta Cana) - 2019 PRICES FROM A$293! Have a question for Paradisus Palma Real Golf & Spa Resort All Inclusive? 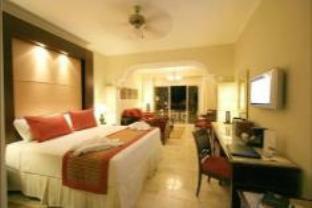 Paradisus Palma Real Golf & Spa Resort offers 5-star, beach-front accommodation. It is just a 25-minute drive from the Punta Cana International Airport and offers swimming pools, 5 tennis courts, 7 restaurants, and child-only areas. At the Paradisus Resort, there are activities for everyone. From kayaking and sailing, to dance classes and sushi-making, the range of activities within the resort ensures that there is never a dull moment. All rooms are spacious, modern and include a flat-screen TV and private balcony. Every room features a 2-person spa bath. Upon check-in photo identification and credit card is required. All special requests are subject to availability upon check-in. Special requests cannot be guaranteed and may incur additional charges. Please note all Royal Service suites are only for adults aged 18 years and older. 24 hr room service, nightly entertainment, eager-to-please staff with a spa & a gym to boot! i can't say enough good things about this hotel. the staff was wonderful & really, really tried to accommodate any special requests. check-in was a breeze. food was good, not great (but lots of variety). day & night activities were better than expected i.e. dance lessons by the pool, beach volleyball, live bands played nightly, etc. there is a vacation ownership pitch that is presented to pretty much everyone, but they weren't nearly as pushy as others i'd experienced in the past. for sitting through it, my friend & i received a vip a la carte breakfast, dinner at one of the a la carte restaurants exclusive to reserve guests & a voucher for future 6 night room accommodation (meal plan excluded). needless to say, i think it was worth the 2 1/2 hrs. i only have a few minor pet peeves...even in a dbl-room, the bathroom / sleep area design makes it so that there really isn't much privacy when using the facilities (note for those non-couple travelers)! i also think the lighting could be a little better in the stair wells (kind of dark at night). lastly, the buffet area, while closed off with sliding glass doors, should probably also have covers over the food to keep the critters off. oh, but the 24 hr room service is wonderful, so you can even skip the buffet all together if you don't mind spending a little extra time inside. 5 Star, High End Exterior Deco.. Food you never seen that.., but in the end forget the hotel.. Theres nothing like Dominican Republic.. (Definitly the place to be. well we arrived from the cold and sorry germany.. to this beaautiful, active, moving touchy, sunny atmosphere.. delited by the free food, you dont have to pay with euros.. so right there a rest point for the mind.. you start getting on the comfort zone, feeling pampered everything is for you.. as long as you want things you can get them, health, death, love, heat and cold... this place has a lot of rum, order the dominican rum.,. this people know their thing okey.. follow my crazy advice an live and enjoy, the way it should be free ! !